It happened at last! 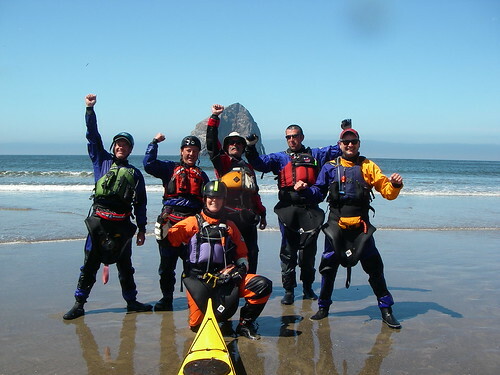 Columbia River Kayaking’s first ever Oregon Coastal expedition finished up successfully last Thursday when we all landed safely on the beach at Pacific City, Oregon, over 60 nautical miles from where we had started on Monday morning in Seaside. Columbia River Kayaking has had this trip in the calendar two years running, but this year we finally got some people who were willing to trust us with their lives on the open coast signed up for the trip, and we were able to make it happen. Our friends from SSTIKS, Marcel and Jenny came along, and also Dave G and Bruce from the Portland area signed up as well, giving us a full trip. 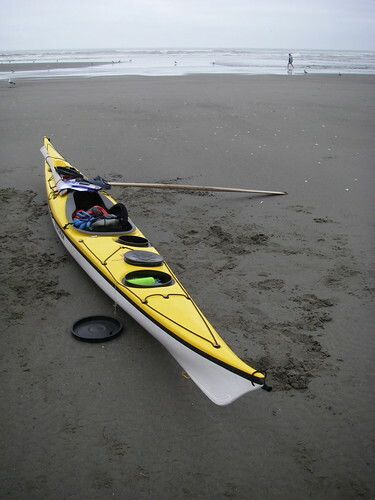 On Sunday night, Ginni and her partner Dave and I headed down to Seaside, Oregon in the Ford truck, stuffed full of gear and carrying a full complement of NDK Explorer kayaks on the roof rack. 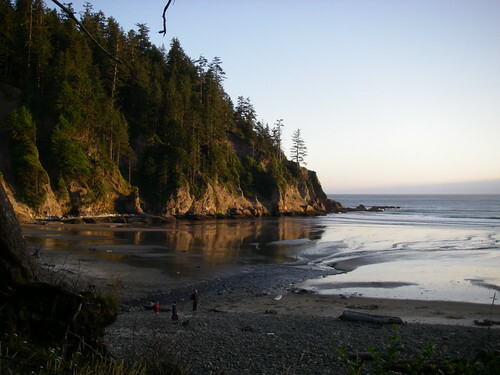 We set up camp at the Circle Creek Campground, met a few of our clients and then Ginni and Jen and Bruce took off to set up the vehicle shuttle: one car and kayak trailer in Pacific City and a car in Oceanside, about half way, just in case. 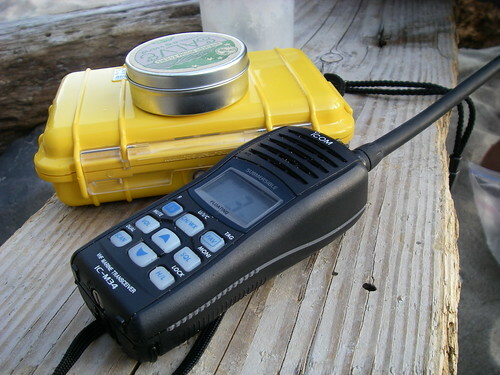 In the meantime, while resorting and repacking my gear, I discovered that my radio battery was nearly dead. I had gone out of my way to get extra batteries for the camera, the GPS and my headlamp, but I had totally forgotten to stick the VHF in the charger before we left. Doh! Dave pulled out spare batteries though, and for a minute, I thought I was saved, until I tried to put one in my radio. Apparently, the spares were for the previous model of ICOM radio and would not fit in the new, floating radios that we all had now. In the morning, we called Englund Marine in Astoria, put three new batteries on the debit card and Ginni arranged for a friend to pick them up and deliver them to us at our campsite that evening. Whew! We slept poorly, to the sound of trucks on the highway nearby, and got up early in the morning to start getting ready. It took two trips with the truck to get all the people and gear down to the beach in Seaside, and then a taxi to get people back from where the vehicles had to be parked for the duration of the trip. The BCU joke is that a shuttle is always a five star trip. No joke! I had never camped out of a kayak before, let alone for four days, and I had packed an awful lot more gear than I ever would have considered for a backpacking trip. I had even gone to REI a week before to find a sleeping bag that would compress into a smaller package than the giant one that I already had. Boy am I glad I did that! The Mountain Hardwear Ultralamina bag that I bought was well worth the price. It is plenty warm and, when compressed, it fits into an extra small NRS drybag. Three blue IKEA bags filled with gear went down to the beach with me, and I was pretty skeptical that I would ever fit it all in the kayak. But twenty minutes later, it was all in there, even the IKEA bags, all rolled up, and I was ready to start the trip. Can I say here that I absolutely LOVE the blue tarp bags from IKEA? It makes the perfect tote for wet kayaking gear. 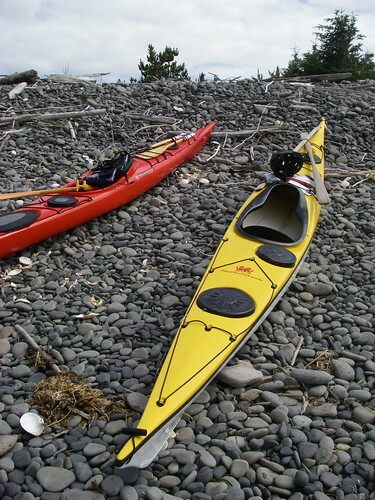 I usually paddle an NDK Romany, a much shorter and lower volume kayak than the Explorer, and the Explorer was going to take some getting used to. My Romany has a hard fiberglass seat that I’ve become pretty fond of, and the foam seat and different backband felt pretty foreign at first. When I hopped in the kayak at the edge of the sea, and started to get ready to approach the surf, I realized that I had forgotten to adjust the footpegs, so I had to stop and fiddle with those. 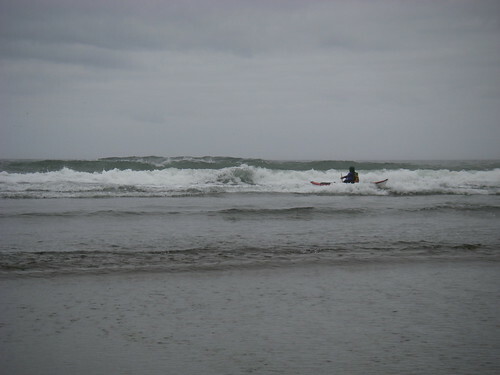 I got them right and pushed off towards the surf zone, but I was still adjusting things and trying to get the seat and backband to be comfortable when I realized, too late, that a good sized wave was just about to break right on top of me. 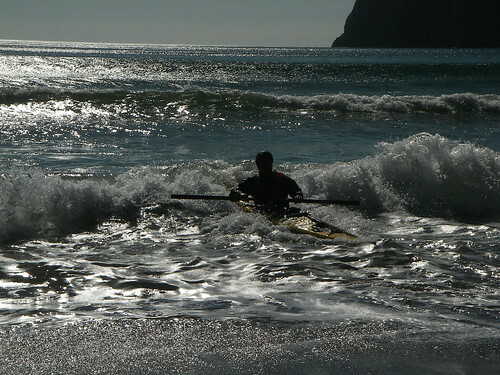 I had no time to brace or try to punch through, and I got capsized and pushed right back towards the beach. 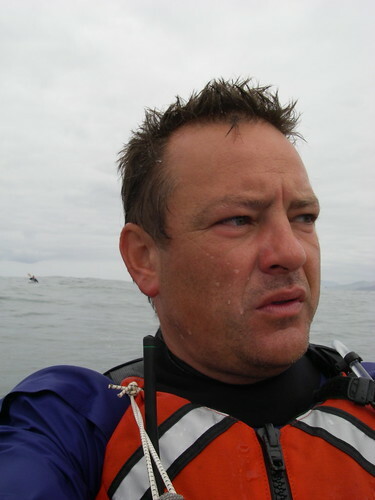 I managed to roll up and head on out, and that was the only time during the week that I capsized, during the first sixty seconds of the trip! Apologies to Jenny, who was not encouraged by watching this. 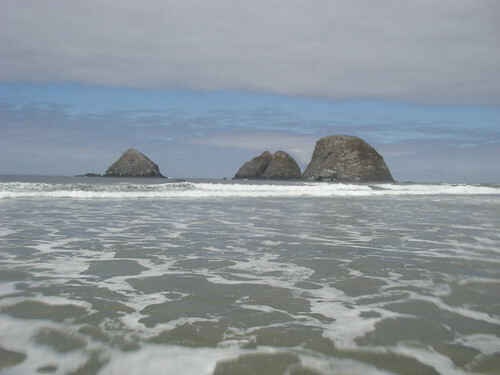 Once we were all at sea, we headed south around Tillmook Head and pulled out for lunch at Cannon Beach, and then continued on south after lunch to Cape Falcon, where we hoped to be able to camp at Oswald West State Park. I tried trolling for salmon in front of Cannon Beach with the handline, but the drag of the gear was slowing me down enough to make me fall behind the group, so I gave it up after a while. 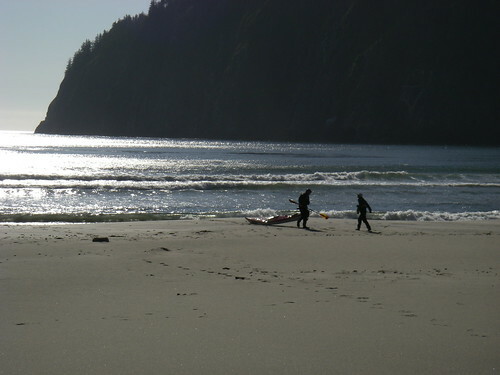 We landed on the beach at Oswald West around 5 PM, after 16.7 nautical miles of travel that day, and one of crew who had camped there before set out to find out where or if we could camp. The park had been closed recently due to some trees falling in the campground, and we weren’t certain what we would be allowed to do. Dave G came back without having found anyone, and so we went ahead and set up camp at the top of the trail to the beach and hung things up to dry, and the other Dave set up the kitchen and made dinner. 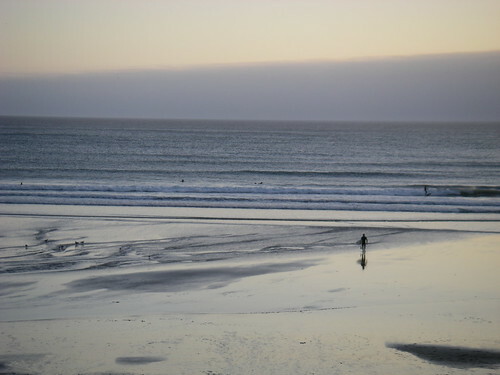 Oswald West has a beautiful little protected beach called Short Sands by the surfers, who flock there in droves. We had a nice evening sitting and watching the sunset, and then got a decent night sleep. In the morning, we were sitting around eating breakfast at a somewhat leisurely pace, with tents still standing and gear all over the place, when the park ranger came into view and headed right over to our table. Boy, he was not happy with us! We were camped in the day use area, and even though Dave G tried to tell him that he had actually been told to camp there once before, he was not having any of it. He gave us 30 minutes to clear out or he would be back with the ticket book and hand out $97 tickets for illegal camping to all of us. No need to tell us twice! 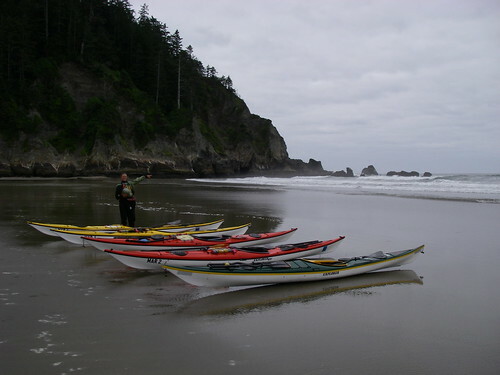 With coffee and bowls of oatmeal in hand, we broke camp and moved the boats and gear down to the beach in record time and when the ranger came back, there was hardly a trace of our illegal camp. When he saw how fast we had cleared out, he mellowed somewhat. We moved on down to the beach, packed the boats and got on the water for the start of our second day. 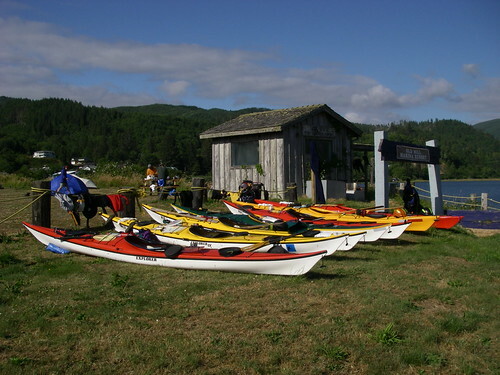 Today’s plan was to head south as usual and pull into the mouth of the Nehalem River for lunch and then cross back out to sea and head on to Tillamook Bay, where we would cross another river bar and camp in Garibaldi, a few miles inside the entrance to the bay. 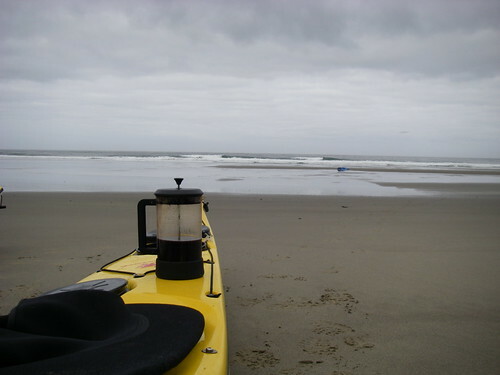 But the weather report was calling for 2-3 foot wind waves on top of 7 foot swell, and the tide was still somewhat low when we arrived at the “NR” buoy at the mouth of the Nehalem River at 11:20 after over two hours of paddling. The bar was closed out completely with breaking waves, some of them kind of large. We decided to eat lunch at sea and continue on to Tillamook, hoping that the entrance there would be more passable, since it is deeper. This resulted in some creative solutions for pee breaks, and one member of the party getting temporarily seasick when he had to sit still in the swell. Fortunately he bounced right back when he was underway again, and we headed on towards Tillamook Bay, with our fingers crossed. 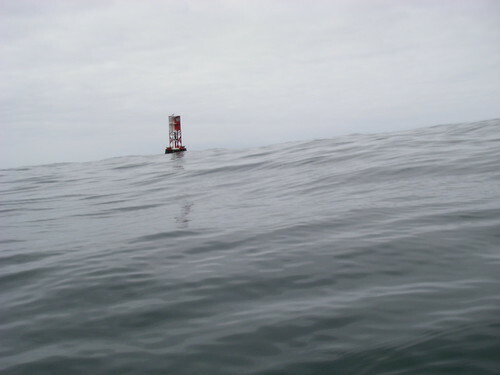 We arrived at the green number one buoy off of Tillamook Bay at 1:15 and, as we were approaching from the north, the bar there did not look much better than Nehalem had. When we got all the way to the buoy, though, and sat to watch the entrance for a while, we could see that it wasn’t completely closed out. Ginni called the coast guard tower on the VHF and they gave us some more detail and told us that there was a way in, and that we would be OK to cross. A half an hour later we were in the bay, and pulling up on the beach for a real lunch, after 13.9 nautical miles and four and a half hours of continuous kayaking. After a real lunch on solid ground, we paddled on into the marina at Garibaldi, making our daily distance 15.8 nautical miles. We discovered that the campground we planned to stay at, the Old Mill Resort, had its own boat ramp, and that we would be able to camp right next to it. We also found running water, free hot showers and even a coin-op laundry. This place turned out to be a much better camping spot for us than I had thought it would be when we scouted it in advance. We had a fantastic pasta and salad dinner and hit the hay pretty hard. 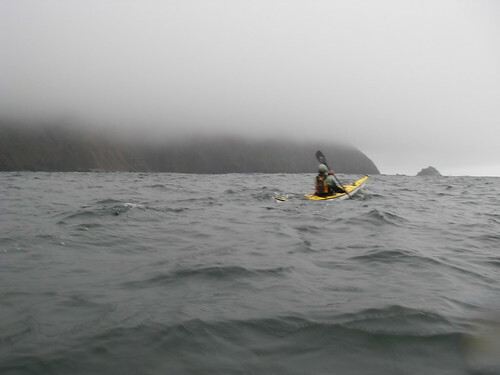 The next morning we headed back out towards the entrance, hoping to find our path free of breaking waves. We got out near the bar and called the Coast Guard again, who told us that the bar was better than the day before and we were free to go. A couple of minutes later though, he came back on and asked me a series of questions about radios, GPS units, flares and trip plans, and then gave us the OK to leave. 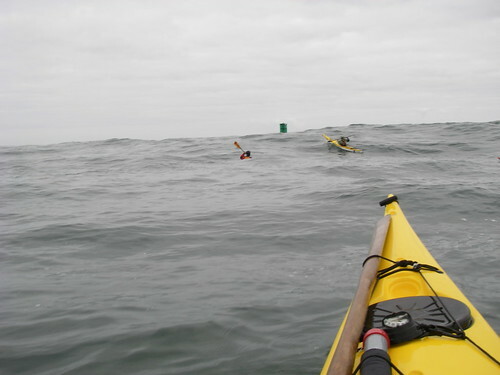 It was an exciting crossing, and we were often out of sight of each other in the troughs of the waves and swell, but we got out without incident and made our way southwest to the “TR” buoy, and then headed south. 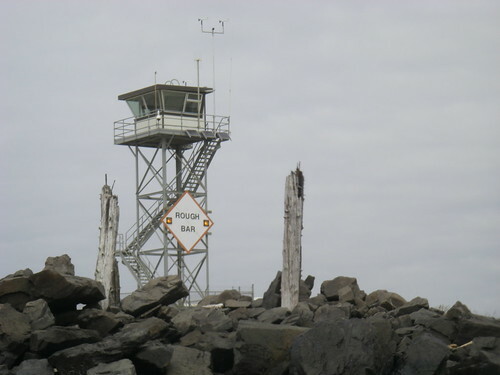 We made good time and we landed in the surf at Oceanside at 11:15, three hours after checking in with the Tillamook CG tower and 11.4 nautical miles from the Garibaldi campground. 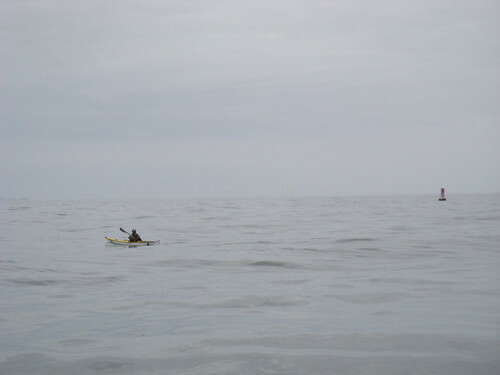 We had a long, restful lunch at Oceanside, got back on the water at 1 PM and pointed our kayaks at the westward tip of Cape Lookout to the south. This leg of the trip was probably the hardest one for me. I ate too big of a lunch, and it took over two hours to stop feeling sluggish and slow. Eventually though, we made it to the tip of the cape, where, just like all the other capes and headlands, the water was confused and choppy, with lots of clapotis and turbulence, and localized wind. Cape Lookout is a very impressive feature on the coast. 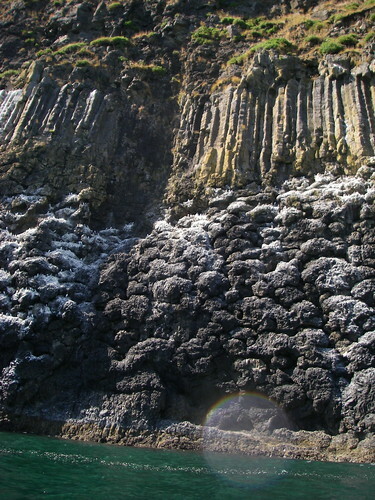 It sticks out into the ocean almost two miles and must be close to 1000 feet high, with rugged, vertical cliffs. In the very end of the cape is a huge cave, maybe a couple hundred feet wide and close to a hundred feet tall. I wish that I had come away with some better pictures of that. I stayed outside with one of the clients and watched the others go in. They were tiny little specks compared to the size of the cave. When we came around the tip of the cape, the wind died down somewhat and our campsite beach was visible now a couple of miles in front of us. I pulled out the handline to fish, while most of the rest of the groups headed towards the beach. Within a few minutes I had caught a black rockfish (Sebastes Melanops), and a few minutes later Dave G and Bruce joined me to do some cliffside exploring and fishing. It was maybe the best part of the trip for me, poking along the edges of the cliffs and kelp beds, checking out the seabirds perched on the cliffs, and hoping to catch another fish. We probably spent close to an hour working our way east towards the beach. 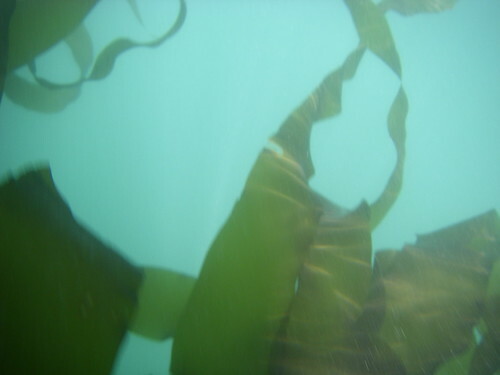 I finally gave up the fishing when I kept snagging up on the kelp and we headed on towards the beach, checking out a cool basalt archway and marvelling at the scale and texture of the cliffs. 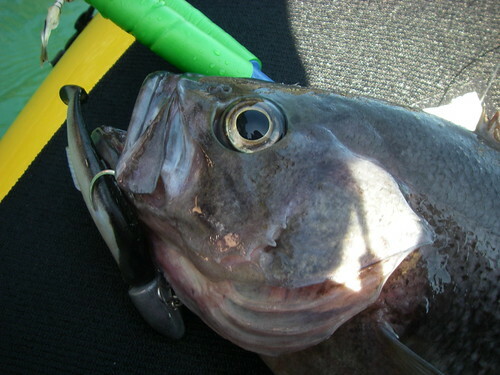 When we got close to the surf zone, I decided that I didn’t want the spiny rockfish fins and fishing lures bouncing around inside the kayak and against my drysuit, so I put the fishing gear back in the day hatch and tied the rockfish to the deck with my contact tow line. I got a couple of fun rides to the beach and was finally on solid ground again, after a day’s travel that was measured at 21.6 nautical miles by the GPS. This was the most beautiful campsite we’d had yet. When we do this trip again, it would be nice to spend a couple of days here, surfing and fishing and exploring the cliffs. I cleaned and cut up the rockfish and Dave put it in the soup for dinner, which was delicious. After dinner, we sat and listened to the weather report for the next day, which was the most benign report we’d had yet, calling for moderate wind and only 3 foot swell. I went to bed while it was still light out. 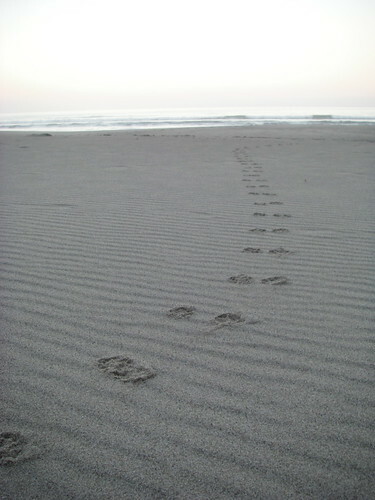 The next morning there were otter tracks all around our campsite and up and down the beach. 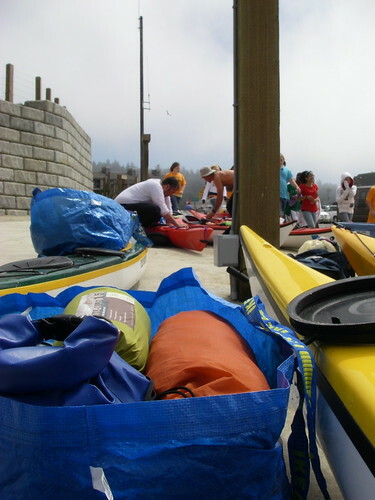 We had a hearty breakfast and got packed and launched for our last day of paddling. 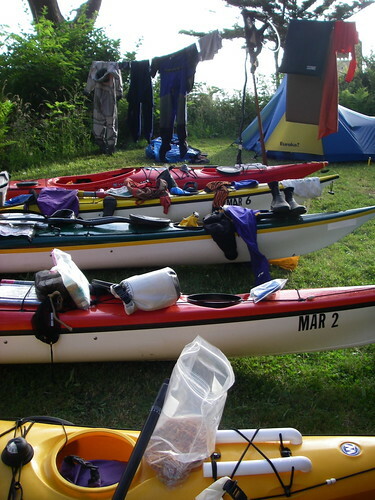 Now that we were so close to the end, neatness in packing didn’t seem to matter as much any more, and as long as it could be made to fit in the kayaks, that was good enough. We started out exploring the cliffs in more detail and poking into caves and arches like this one that Jenny is in. After some time exploring like this, we finally headed south towards Haystack Rock next to Pacific City, where vehicles were waiting, and food and beers at the Pelican Pub. 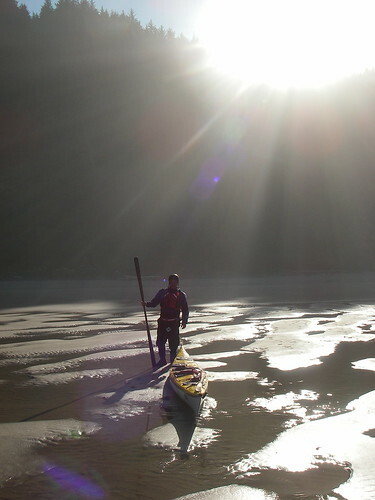 Today’s trip would be our shortest day, and we landed at Pacific City at noon, in the smallest surf of the whole trip, after rounding Cape Kiwanda in some of the biggest, most confused seas of the trip. The mileage today was 9.3 nautical miles, making the trip total come out to 63.3 nm. It was a long carry across a busy beach, in soft sand to the parking lot, where we spent quite a while unpacking and cleaning boats, and some of us went over to the hotel room that Dave G had rented for hot showers. Some of the gang went back to pick up the other cars in Seaside and Oceanside and brought them back to where we were waiting. Once we were all packed up and the boats were loaded up, we walked over to the Pelican Pub and had our last meal as a group, complete with appetizers and pints. 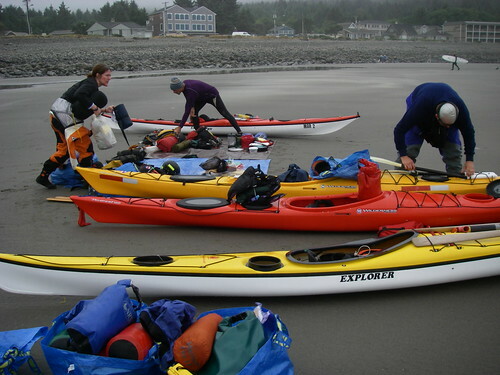 It took almost two hours to get everyone back to the truck in Seaside, where Dave and Ginni and I loaded up the kayaks (again!) and finally headed home. All in all, the trip was a great success, and we are hoping to do it again next year, and are already looking south to the next stretch of coastline. 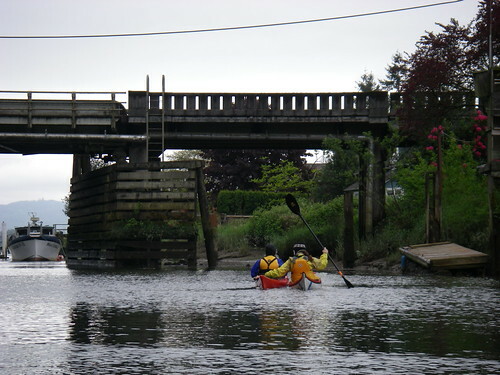 Today was the first Columbia River Kayaking Immersion class of the 2008 season. We got a full roster of 6 students and I spent the day working with Ginni learning how to teach this class. 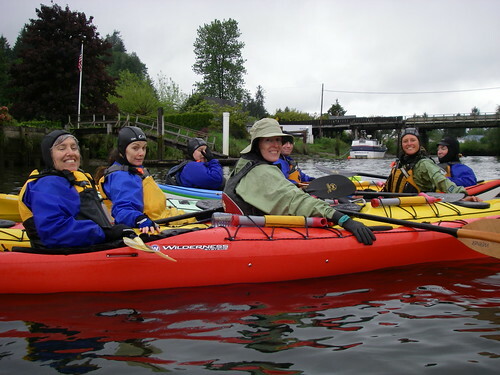 We had a great group of people from around the Northwest, all beginners or nearly so. It is so exciting as an instructor to watch people improve over the course of the day! 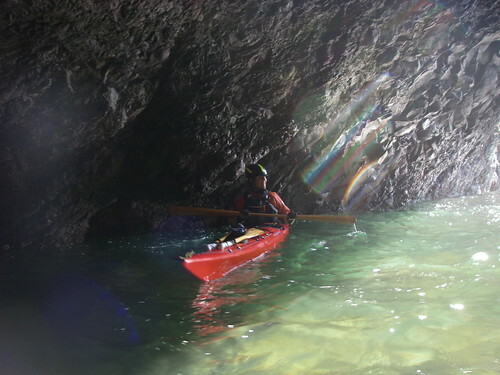 Immersion is a day long introduction to the basics of sea kayaking, including basic navigation, trip planning, wet exits and deepwater rescue basics. 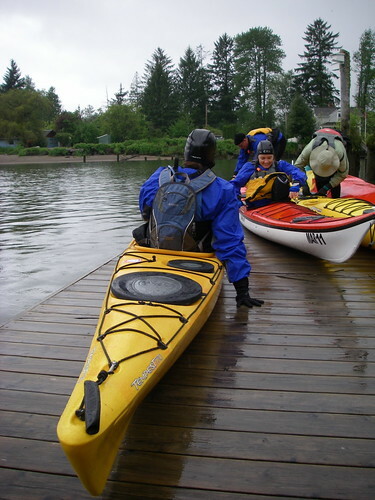 if you are thinking of getting into sea kayaking, or getting back into sea kayaking after years of absence, you can’t go wrong taking a thorough introductory class like this one. Here’s a few pictures to enjoy, many thanks to Pentax, for making this awesome waterproof camera. Getting ready to kayak. 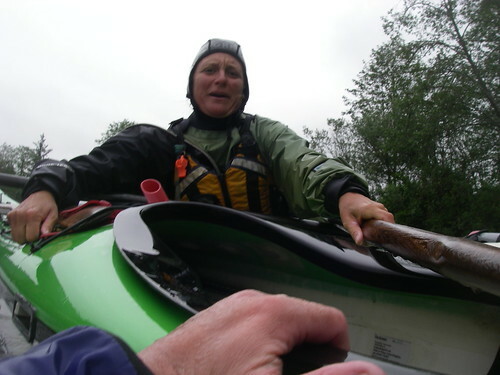 It’s important to have a good fit to the kayak! Paddlers practicing handling each others’ boats. Rescued! Here’s Ginni, demonstrating rescue techniques with me as the water dummy.